My paintings explore the magic and surrealism of life at its most mundane and everyday level. Through studying people, and mountains, and trees, my aim is to highlight the universality of humanity and the way we try to weave meaning into it all. I am interested in God and visual language, but also in combining the two to make suggestions about the scenes I paint. By layering, refracting and blurring my references, I hope to create a body of work that is visually hyperreal and dense with opportunities for interpretation. Pattern, texture and high-pigment colour are combined to further emphasise these ideas. I have developed a way of working with fabric that allows me to remain playful and experimental, whilst at the same time referencing the cultural, social and historical context of the work, as well as the traditions of oil painting. 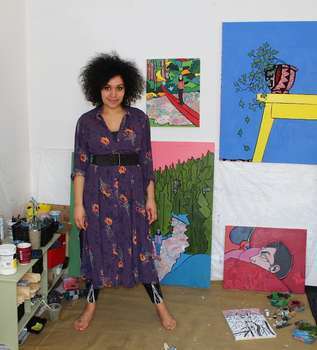 I am a contemporary painter, who is African, Scottish, English and British, which is part of my identity, but also vital in the way I make my work. 2017, Pittenweem Art Festival Bursary Award. 2016, Dundee Visual Artists + Craft Makers Award. 2015, Thomas and Margaret Roddan Trust Award. 2014, Leonardo Da Vinci Project. 2010, Juliet Gomperts Trust Award. 2014, Saudades, CCOB, Barcelos, Portugal. 2014, Language/Lingua, The Bread Factory, Portugal. 2014, Time/Tempo, The Bread Factory, Portugal. 2014, Line/Linha, The Bread Factory, Portugal. 2012, New Rad, Radcliffe and Newlands Ltd, London. 2011, Responsive Eye, London Gallery West, London. 2010, Luxury Goods; The Role of Art, The Courtyard Theatre, London. 2009, Polyglot, P3, Baker Street, London. 2009, Icons, London Gallery West, London. 2008, News From Nowhere, London Gallery West, London. 2008, LaLaLa Exhibition, 491 Gallery, London. 2007, Super Ego, University of Westminster, London. 2007, Conflict, University of Westminster, London.